FAA’s ATADS data shows Peak Year was 2007. Total airport operations in 2014 were DOWN 12% from the peak year. Hartsfield – Jackson Atlanta International Airport is the second busiest airport in the world. It has five parallel runways, running east-west, and is the main hub for Delta Airlines. The 868,359 operations in 2014 equates to an average of 2,379 daily operations, or 50 takeoffs/ATC-hr. The two other busiest U.S. airports are O’Hare [KORD] (with 2,416 daily ops) and Dallas Fort Worth [KDFW] (with 1,863 daily ops). The airport was an abandoned auto racetrack in 1925, and the infield area of that racetrack had been used as an airstrip. The City of Atlanta obtained a 5-year lease and committed to developing an airport. The city purchased the airport land outright at the end of the 5-year lease. In 1930, Delta Air Service, based in Monroe, LA, started regular flights connecting Atlanta and Fort Worth. A control tower was added in 1939. In October 1940, the U.S. government declared the airport an air base (as was done at nearly all significant U.S. airports in the war years). In 1941, Delta Air Services relocated its headquarters from Monroe, LA to Atlanta. The airport facilities were substantially expanded during the war years. By 1957, Atlanta had become the busiest commercial airport in the U.S. A new terminal was constructed to accommodate the large number of passengers. In 1980, the world’s largest passenger terminal was opened; a $500 Million project, it was designed to handle 55 million passengers per year. In 1984, the fourth parallel runway was completed. Groundbreaking for the fifth parallel runway was in April 2001; this was part of a $6 Billion, 10-year capital improvement program. 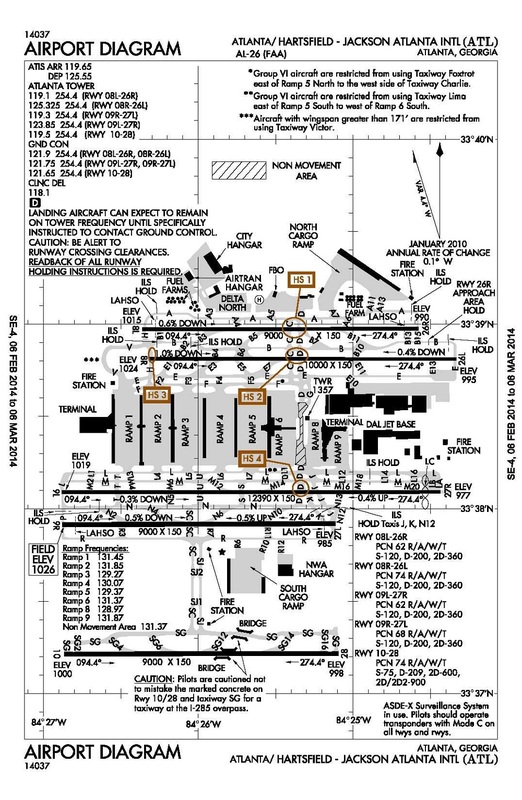 When the fifth parallel runway opened in May 2006, it was hailed as “The Most Important Runway in America.” In the month of July 2009, the airport had 88,408 flight operations, a world record. The annual airport operations peaked at 991,617 in 2007, but have since declined by 6%. Numbers are likely to climb past a million, though; Southwest Airlines, which had judiciously stayed away from ATL for its first forty years, began operating flights in early 2012. FAA has a major presence at this airport (and in the Fulton County area), including a control tower (ATL), the administrative headquarters for FAA’s Southern Region (ASO), the administrative headquarters for FAA’s Eastern Service Area (ESA), and the administrative headquarters for FAA’s Air Traffic Organization Eastern Service Center (ATO-ESC). The economic impact of these thousands of FAA jobs is astounding. While the median household income in Fulton County, GA was $56,313 in 2010, the top 200 FAA paychecks in Fulton county that same year ranged from $136,123 to $194,937. Of these top-200 paychecks, 65 were air traffic controllers, averaging $152,831. Two other huge FAA facilities are nearby, in Henry County (the enroute center (ZTL), in Hampton, GA), and in Fayette County (the Atlanta TRACON (A80), in Peachtree City). As for environmental impacts, the incessant streams of air traffic have resulted in enormous investments in noise insulation. The airport has a brochure, Aircraft Noise Information, which states that nearly $180 Million has been spent to acquire 2,720 structures and relocate the residents. It also says that more than $174 Million has been spent installing sound insulation in more than 10,000 structures. That sound insulation is rendered useless if residents want/need to open a window to air out the house; that simple homeowner luxury is denied at these many locations, which thus have to depend more heavily on energy-consuming air conditioning. Notably, the level of air traffic at KATL is far above what the local population needs for their own air service. This massive relocation and investment was necessitated to accommodate the over-development of this airport’s hub-and-spoke network, to facilitate profits by the airlines, primarily Delta and Southwest (which started ATL flights in early 2012).